I’ve been making this fabulous chicken dish created by Karen Martini since it was published in our daily newspaper’s Sunday magazine several years ago. Sweet and spicy, the chicken looks fantastic on a bed of couscous taken to the table on an intricately decorated platter. Like every cook, my ego needs to be massaged so the chorus of oohs and aahs that usually greet this dish has led to me cooking it for many of my friends. I have had people refuse to leave my house without this recipe. I have messed with the original formula a bit. I add carrots, chick peas and sometimes baby zucchinis so we have a one pot dinner and I’ve made necessary adjustments to the recipe to comply with my family’s dietary challenges, but the crux of this dish, the beautiful flavour remains unchanged. It’s big, it’s bold and it’s beautiful. You’ll find this recipe and many other delicious creations by Karen Martini in her book “At Home Cooking” that is being explored during March on the Cookbook Guru, hosted by Leah. In a large freezer bag, combine the salt, flour, ground cumin, cinnamon, turmeric and pepper. Add the chicken pieces to the bag and toss to coat the chicken in the spiced flour. Heat the oil in a large lidded pan, then thoroughly brown the chicken and set aside. Sauté the carrots and ginger then add the chilli, cumin seed and thyme. Cook for 2 minutes. Add the garlic, tomatoes, lemon juice and zest, brown sugar, currants, chick peas and stock. Stir well then return the chicken to the pan. Cover the pan, bring to the boil and simmer for 20 minutes. Uncover the pan and simmer for a further 15 minutes. I don’t know how I missed this post!!! This looks amazing and for once when I read a recipe that looks so inviting I can get all the ingredients for it! Yay! 🙂 I know what’s on the menu for this week. Well we’ve seen the original version of this recipe…now try out this beautiful evolution that Lady Red Specs has come up with. It’s proof of the value of idea’s that you can get from exploring Karen Martini’s work. First of all your photograph is convincing enough. Then after a glance at the ingredients, oh my Sandra! This looks like something I would love. 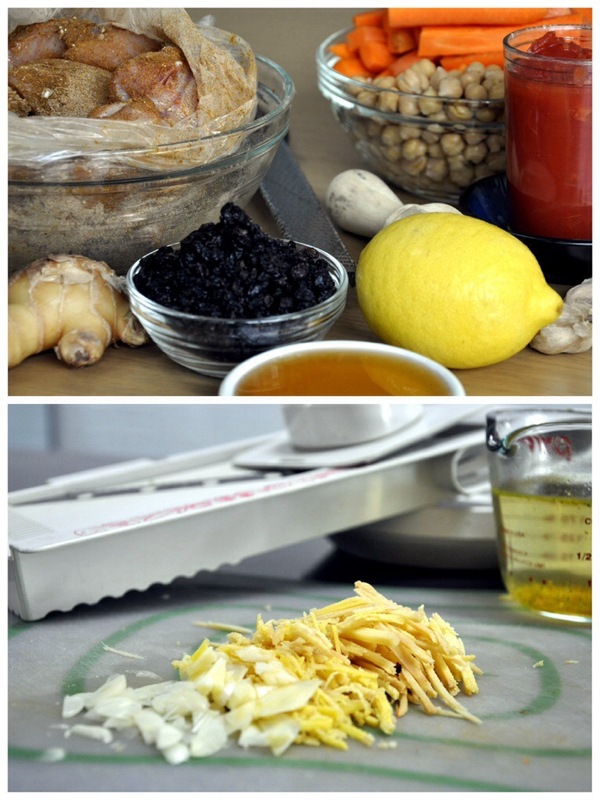 All the spices, chickpeas and chicken sound wonderful. And if your guests are refusing to leave then until you hand over the recipe, then I know it has to be off the charts. Thank you! This dish just has that something that makes it especially delicious. The flavours are quite bold, but the sweet spiciness make it a dish well worth making! Would you belive it took me quite awhile to ‘make friends’ with Karen Martini’s cooking – perhaps till I bought a book of hers and found that I really liked her recipes, tho’ did modify a few because of fat content and mode of cooking. This sounds quite delightful – cook a lot of Middle Eastern food but have to try this exactly the first time around!! I am pleased for the lady that just today another Sydney food blog published another of her recipes . . . nice to see when hard work bears fruit . . .
What a beautiful looking dish, and not quite like anything else I’ve had. I bet it’s delicious! Thanks, the flavour of the spices and the other aromatics blend beautifully, well worth making! I’ve read paying attention to the huge list of ingredients… I’m in love with all of them… so I’m pretty sure that I would love your Syrian chicken! The long list of the ingredients fools one for this, a little time consuming but not a difficult dish, and yet so healthy with all kinds of healthy ingredients. Mmm that looks just soo good! Love the colours! Thanks, yes it’s a good looking dish and the flavour matches the looks! This dish is clearly popular, I really will need to try it. I think you will be happy when you do. Really yum! I’ve never heard of Karen Martini, but will need to investigate now. Karen is a Melbourne chef who made a name for herself in restaurants before being taken up by the print media and TV. Her food takes lots of interesting twists and turns without being ridiculous. I looked her up online and came across her web page – really fabulous types of food she makes. Thanks for introducing her to me (via the Cookbook Guru!). If I had her book, I’d join in. Perhaps next book. You don’t need the book to join in, there are loads of her recipes online. Karen writes for the Epicure in our daily newspaper, that’s where my collection of her recipes come from. 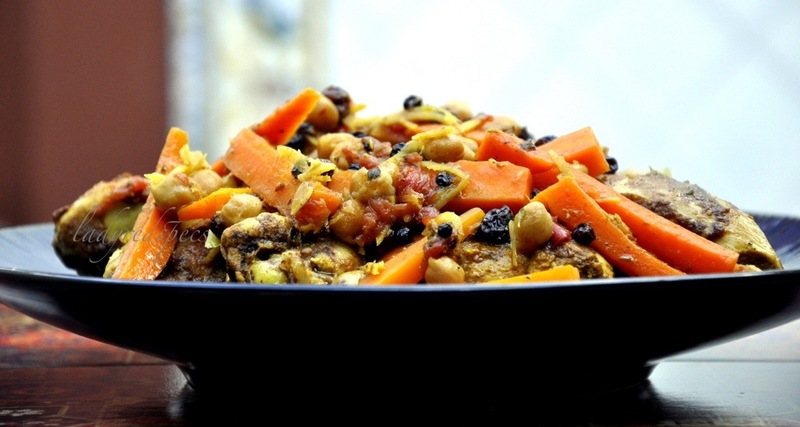 This entry was posted on March 11, 2014 by ladyredspecs in Chicken dishes, Food, Gluten Free, Main Meals, The Cookbook Guru and tagged carrots, chick peas, chicken, lemon, spices.